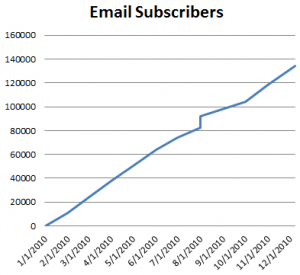 One of the most valuable assets a company has is its database of email subscribers. Just ask highly successful large companies like Papa John’s, Scotts, and Hitachi Data Systems as well as hundreds of small and mid-sized companies like CardsDirect, Aptera Software, and Powell’s Books. Each of these companies has the ability to deliver relevant and timely information and offers to their email subscribers, when they need to do so. By, “owning their own communications channel,” these companies are not dependent on traditional print or broadcast media to attract customers or drive repeat sales. They have the advantage of choosing when, how and with whom they communicate. Clearly, email has proven its value for aiding the customer’s buying process and driving repeat sales. And in testing conducted by the Direct Marketing Association (DMA), email delivered the highest ROI of all direct response marketing methods tested. So if your objective is to use email as the backbone of your company’s marketing, sales, and customer service operations, you need to invest in the right strategies and tactics to attract email subscribers. 1. Search Engine Marketing. Usage of search engines like Google and Yahoo that make information on the Internet easier to find have revolutionized the way brands and companies “lead” customers to their websites. That’s why you should not overlook Paid Search as a tactic for attracting new email subscribers. I like paid search because it allows marketers to attract the “right kind of customer” to their website. And once you get them to your site, you have a golden opportunity to invite them to become an email subscriber. 2. Social Forward. Social Forward is “new age word-of-mouth-marketing” and is fast becoming an incredibly effective technique for attracting new email subscribers. By embedding social media icons in the email content for top social networking sites like Facebook, Twitter, and LinkedIN, marketers can empower existing subscribers to share the email they receive with friends and colleagues with whom they are connected. And when the email is shared with a non-subscriber, they are invited to opt-in. It allows recipients to share special offers, articles, and other content in the email. This type of word-of-mouth promotion is invaluable. It enables companies to expand the distribution of the email campaign beyond current subscribers. This “multiplier effect” can be huge for driving brand awareness and sales. One brand that uses Social Forward very effectively to expand their database of email subscribers is Dreamfields Pasta. In two years, the brand has built a database of 400,000 consumers and 18,000 healthcare professionals. Email and word-of-mouth-marketing have become the cornerstones of Dreamfields phenomenal success. 3. Mobile Opt-in. Smart phones have forever changed how marketers use text messaging as a direct response tactic to engage consumers and provide them an opportunity to subscribe to the company’s email communications, special offers, and customer service alerts. For retailers like Pier 1, consumer packaged goods marketers like Scotts, restaurants like Taco John’s, and service providers like Expedia, text is fast becoming an ideal tactic for interacting with customers’ regardless of whether they are in a store, at an event, or on foot. And that’s why it’s so smart to use text to make it easy for consumers to¬†subscribe to your email communications. By inviting consumers to opt-in when¬†they are most interested and engaged, marketers dramatically improve their¬†chances of gaining new subscribers. Joel Book is Director of eMarketing Education for ExactTarget, the world’s leading provider of on-demand software for permission-based email and mobile marketing. With more than 30 years of experience in database marketing, Joel combines proven strategies and tactics for customer development and retention with contemporary one-to-one marketing and social media technology to teach organizations how to attract new customers, aid the customer’s decision-making process, and drive repeat purchase.